Bowen Technique is a soft tissue technique where rolling moves are made over precise points of the body, working over muscles, fascia, ligaments and nerves, providing alignment, reducing pain, improving muscle flexibility, movement and posture. When was the last time you took an hour to completely relax and give yourself an opportunity to recharge? Bowen is incredibly relaxing, allowing the body to initiate its own healing mechanism, how incredible we already are! An incredible side effect is that you feel and appear taller and straighter after a Bowen session and more aware of your posture. The most important thing you can do is give yourself permission to relax and hang loose in whatever way works for you. However, some of us need a little encouragement from time to time and this is fine. It is common for previous injuries to be supported, reduce pain and help prevent further injury. During a treatment, precise moves are made by the therapist over muscles, fascia, ligaments and nerves, sending neurological impulses to the brain, creating a vibrational pattern that re-aligns the musculoskeletal system to its original state, thus old or new injuries are worked upon. Fascia is a three-dimensional web, that is ever-flowing and uninterrupted. It envelopes the entire body, connecting our superficial skin layer to the deepest tissues. 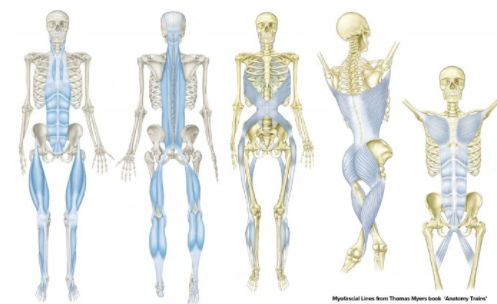 When fascia is restricted it has an effect on our complete health, affecting not just muscular and skeletal health, but nerve capacity, gland and organ function and our general well being. Over time repeated movements, trauma or poor posture can cause sticking and tightness, Bowen supports to release any tension and provide a balance through working directly upon fascia. Bowen is amazing at easing up knots & tension through deep cellular relaxation. There is NO forceful manipulation. Bowen ‘asks’ the body to recognise and make the changes it requires and over the week after a treatment, the body responds and readjusts safely according to its needs. If your jaw, shoulder, hip, pelvis, sacral joint, ankle, back or knee is out of alignment, it will affect your movement and the rest of your body, if it isn’t now, it may lead to future discomforts. Bowen provides gentle realignment, which the body is able to hold, releasing pain and compensation patterns. The improvement can hold for weeks, months, years or indefinitely, depending on the individual and their lifestyle. Increase in circulation brings rich blood supply to damaged, stiff, and tense muscles and supports blood to flow into tissues. As a result, this action improves the lymph fluid circulation, which carries metabolic waste products away from internal organs and muscles. In turn, this results in lower blood pressure levels and improved overall body function. The theory of what makes Bowen Technique effective is that it connects the mind and body through nerves and receptors. The moves performed by the therapist are designed to create a restoration of the structural integrity between the brain and the body, thus reducing discomfort and restoring a harmonic balance. Because you deserve some relaxation and timeout when was the last time you didn’t feel stressed? How do you manage stress? I tell you a secret, finding something that relaxes you is key to good health. Bowen can relax and relieve stress, as it works via the autonomic nervous system, producing good results by penetrating to a deep cellular level. Bowen Technique can be supportive for all, from newborns up to the elderly. It works in a gentle but powerful way that involves no heavy manipulation. Benefits can be seen from only 1 to 3 sessions, but relief can be felt immediately. Bowen Technique available in Easton, Bristol and near Bridport Dorset. Pricing £35 for 1 hour.